University of Iowa "Fight for Iowa"
Catch the team spirit! Custom University of Iowa Decals! Show your school spirit and style with our University of Iowa Hawkeyes Fight for Iowa Vinyl graphics. 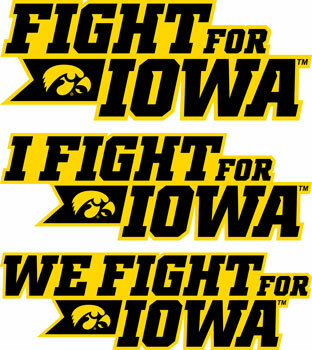 Our University of Iowa Fight for Iowa Vinyl Decal is available in 3 styles; Fight for Iowa, I Fight for Iowa and We Fight for Iowa. Spark a sign of your team spirit in your home, on your vehicle or electronic device. This decal captures the university's Logo Tigerhawk as well as its familiar Fight Fight Fight for Iowa theme song.